There is no category of incident more maligned than the so-called ‘near miss’. One can make such an assertion precisely because near misses are so under-reported or even unreported in many different companies across all industry sectors. It is well-known that near misses are usually nothing less than an incident that did not occur due to simple luck. As the definition of a near miss states: it is an unplanned event in which there was no resulting injury or damage, but which had the potential for such injury or damage. It’s a case of coulda, woulda, shoulda. Yet near misses continue to be hopelessly under-reported. Why is that? For one thing, it’s all about human nature. We tend to want to skip along after something occurs that could have been serious yet, thankfully, was not. There may be the thanking of proverbial lucky stars, a nervous giggle or the exhale of pent-up breath, but the tendency is to move on. It’s how we are wired. We don’t like to confront potential problems if they are viewed as having been ‘unproblematic’ in the end. The psychology of near misses has been fascinatingly studied by psychologists, primarily with regard to gambling and gaming. These studies show that the effect of a near miss in gambling, for example, is to ensure future play, i.e. ‘this time I missed the jackpot but I’ll get it next time’. But an indirect analogy can be made in EHS incident management as well. A worker at a refinery nearly falls into a large manhole because it is undemarcated and he was distracted. He walks away relieved at not having been seriously injured, and assuring himself that he’ll not make such a mistake again. Close call! Never mind that the manhole should never have been undemarcated and that the worker should never be distracted in a hazardous work environment. In essence, it’s a gamble. For another, the reporting of near misses is too often viewed as a nuisance, as ‘overkill’ or, that most egregious of excuses, as even a waste of time. As if preventing future incidents could ever be considered a waste of time! With production targets forever pushing workers and managers to the limit, where is the time to report a ‘trifle’ such as a near miss, right? The very words ‘near miss’ suggest that which is of little importance. Or in which something bad didn’t happen after all, so let’s be thankful for that – and move on. Again, it’s that Lady Luck factor that is the downfall of near misses. But any manager or supervisor who allows such a cavalier attitude in the workplace with regard to near miss reporting does so at their own peril. After all, it is well documented that there were a series of equipment-related and personnel-caused near misses in the months leading up to the catastrophic explosion in April 2010 on the Deepwater Horizon oil rig in the Gulf of Mexico. Eleven workers perished in that disaster which resulted in the largest marine oil spill to this day and devastating pollution to U.S. coastal communities. Those near misses were nothing short of ticking timebombs on that oil rig. Not all near misses have such huge potential to cause harm. Some near misses remain exactly that – misses. 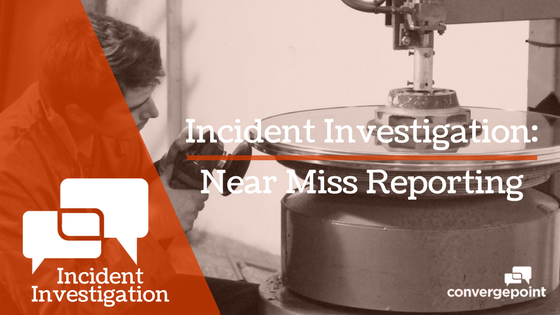 However, to under-report near misses is to undermine and diminish the effectiveness of an incident management system. It also creates laxity where there should be attentiveness and action. In incident management, it often really is all about the little things.